'In a palm tree, on an island, in the middle of the wide blue sea, was a girl. Nim's hair was wild, her eyes were bright, and round her neck she wore thre cords. One was a spyglass, one was a whirly, whistling shell and the other a fat read pocket knife in a sheath. Whilst searching for Australian Authors for the Aussie Challenge I discovered that Wendy Orr was now considered an Aussie. She emigrated a few years ago and has now got her citizenship, so I thought she would be ideal to read for the challenge. I have watched Nim's Island so many times with my girls, that I do feel it is up there in my list of favourite films. With this in mind, I was desperate to see if the book lived up to the film. I found it to be a lovely book, very easy to read, definitely enjoyable, but quite different from the film. 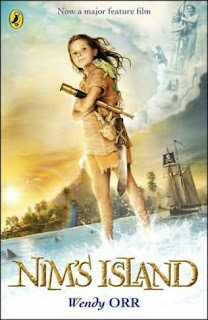 In the film, Nim's father disappears whilst caught up in a storm and Nim is left to survive on their secret island on her own. Her only form of contact is with the writer Alex Rover, who Nim is convinced is the same intrepid explorer she reads about in her books. Alex Rover is really Alexander Rover, the author who suffers from OCD and is agoraphobic; she hasn't left her apartment in months and spends all her days talking to her imaginary character Alex Rover. In the end Alexander Rover comes to Nim's rescue, only to shatter her illusions about the Alex Rover she believed she was contacting. From the first page of the book, it is apparent that Jack has already left Nim on his journey to find new species of plankton. Where in the film, he loses contact with her, within the book they manage to communicate by attaching letters to Galileo's (a friendly pelican) leg, so Nim is never in fear that her father has been lost at sea. The Alexandra Rover within the book is completely different from the one in the film, as she has absolutely no hang ups and doesn't talk to imaginary characters. She is only to eager to correct Nim's perception of her and from the very beginning Nim is aware that Alex is actually a lady writer called Alexandra and not an intrepid explorer and adventurer. The book character of Alex Rover was not as visual within the book, as he was in the film, in fact he is hardly mentioned at all. I felt the book was less dramatic than the film version, but still very entertaining and definitely one I would recommend for children. The film was obviously beefed up to make it more screen worthy and the characters were given a lot more traits to deal with. Trying to decide which I liked best, I found that I couldn't decide; they were both equally good in their own way and often seemed like two different stories. If you like reading about islands of paradise and adventures at see, then this is a book you will definitely enjoy. I feel like I live under a rock - I hadn't heard of the film! But the book sounds like one for me. This is a new one for me Vivienne, I've never heard of the book nor the film. Going by your review I must put both on my to read/watch list. I loved the movie as well so I'm not sure if I should read the book. Great review and of course now I want to watch the movie again LOL. Nymeth - knowing how you have been searching out lots of children's books lately, I did think that it might be one that you would enjoy. Petty Witter - Ooh it is lovely. The film is just fabulous and well worth a look, just to watch Gerard Butler. Alaine - it is one of those films that you can just keep watching over and over again. I've never seen the movie, but both it and the book sound good to me! I'm with Nymeth. Where have I been? I think this one sounds like my kids in school would like it. I'll have to add it to my book order this year. Like some of your other commenters, I've never heard of Nim's Island before either. How lovely to so greatly enjoy a movie with your daughters! I just wanted to say that if you look again, you'll see that in the book, although Alex thinks she's corrected Nim's perception, Nim doesn't understand, and goes on believing that Alex is a woman until Alex sets out for the island. Bermudaonion - definitely worth reading and watching. Wisteria - I am surprised it is not as well known as I thought it would be. I thought most schools might have it, especially as it is a movie too. Suko - I am amazed that it is not so well known. Wendy - Thank you for taking the time to drop by. I stand corrected on that point. I want to read the book all over again. I intend to read the next one too. I seen the movie - havent read the book. Sounds good! I havent read the book, but my daughter insisted we rent the film. I remember being pleasantly surprised that Gerard Butler played the father! lol.